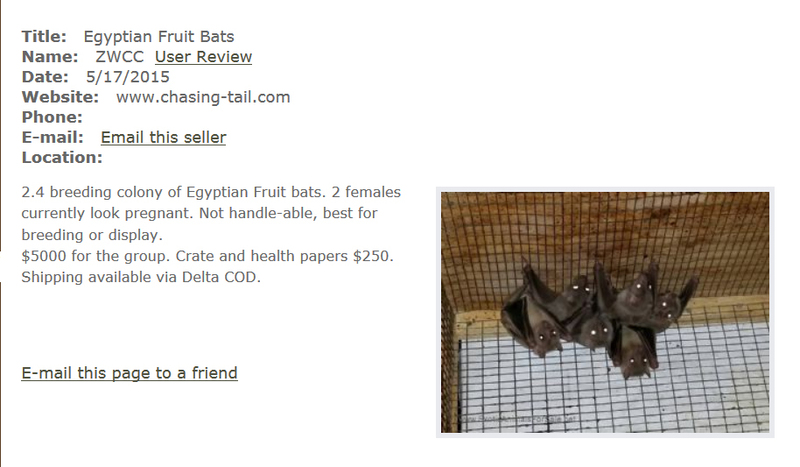 Thinking about buying a pet bat? Then you need to read this first. Flying Fox Conservation Fund – is this really conservation? Zoological Wildlife Conservation Center – is this REALLY Conservation? So why then, is the Zoological Wildlife Conservation Center selling Egyptian fruit bats into the cruel, exotic pet trade, knowing that these animal are doomed to a miserable short existence in tiny cages. 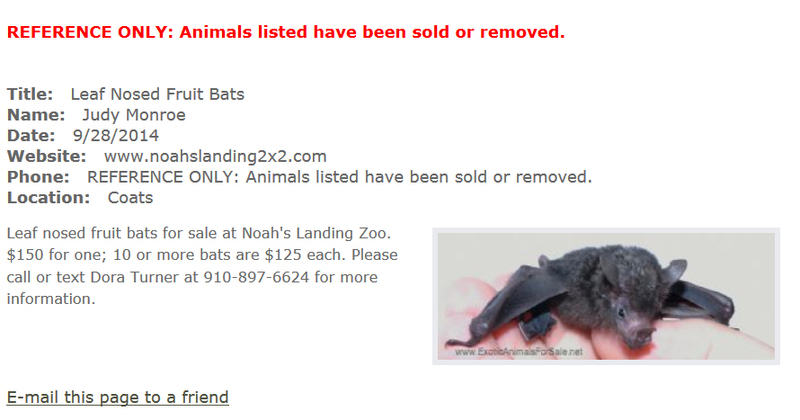 Notice the Zoological Wildlife Conservation Center is selling pregnant bats, who will likely abort or abandon their pup because of the horrific life they have been sold in to? This is one of the ads the Zoological Wildlife Conservation Center has placed on the internet. Notice the complete lack of enrichment and lack of a sufficient place to hide in this sad photo of the bats. What happened to “…our primary focus is on the long-term physical, mental and emotional care of captive wildlife populations.” ??? Of course, the Zoological Wildlife Conservation Center’s ad does not contain the information that the high price paid for these bats will be wasted when the bats die, likely within the very first year. The Zoological Wildlife Conservation Center is no better than the “Flying Fox Conservation Fund” in taking the highest dollar possible for bats at the unsuspecting buyers expense. So why then, is the Noah’s Landing Zoo selling baby fruit bats into the cruel, exotic pet trade, knowing that these animal are doomed to a miserable existence and certain death? Could it be that the almighty dollar was more important than the lives of these innocent animals? This is one of the ads the Noah’s Landing Zoo has placed on the internet. What happened to “… offer enrichment, safety, and comfort to our animals. …Demonstrate the importance of preservation and conservation …and respect for the world around us.” ??? Of course, Noah’s Landing Zoo‘s ad does not contain the fact that the high price paid for these bats was wasted when the bats died, likely within the very first year. Shame on you, Noah’s Landing Zoo. These young animals deserved better. 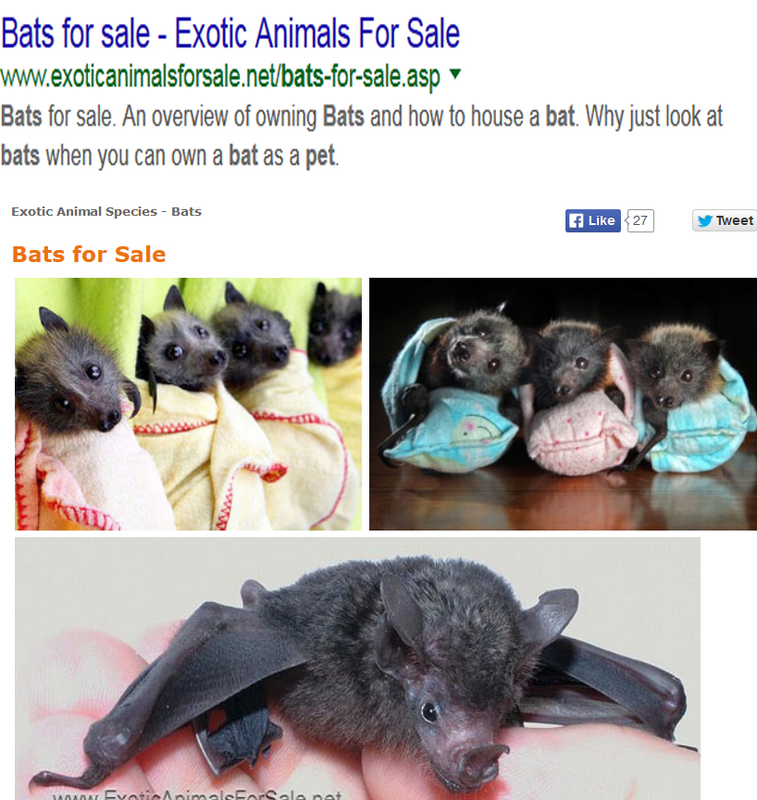 The site “Exotic Animals for Sale” is illegally using copyrighted photos to lure people to purchase a bat from the cruel exotic pet trade. They don’t include the likely fact that bats don’t survive when kept as pets. Nowhere in the ad does it tell you that bats typically die within the first year of attempting to keep one as a pet, and the $800 to $2,500 a buyer spent on a “pet bat” is money wasted.